These disposable Vomit Bags are an effective way to maintain or improve your existing hygiene control. They are folded and wrapped in such a way that minimises storage space and keeps each bag pristine until requires. The easy open design and fully lined construction ensure that all liquids will be held securely until safe disposal is possible. Each bag has a white finish to coordinate with existing colour coding schemes and is an ideal way to supplement Biohazard management. 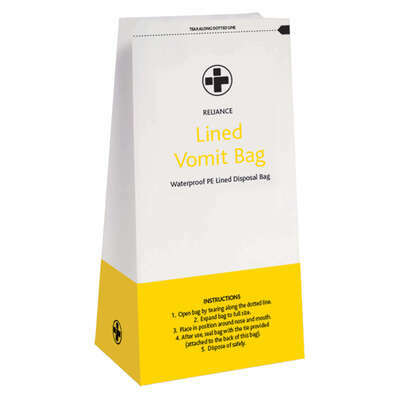 Designed for use in all environments from nurseries through to offices, these vomit bags are a handy addition to your workplace. Our Wipes and Infection Control category is home to a wide range of high-quality products, from our Biohazard Kits through to Hand Sanitiser.